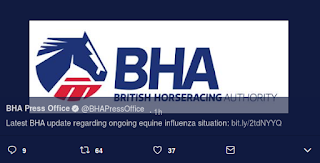 Two days ago the British Horseracing Authority (BHA) ordered All Horse Racing Halted After Equine Flu Was Reported In 3 Vaccinated Horses. Since then, there have been reports at 3 additional horses have tested positive, and the ban on horse racing has been extended until at least the middle of next week. Today's update provides us more information about the particular strain of the equine H3N8 virus detected - which unexpectedly turns out to be Florida Clade 1 - which is endemic to North and South America, but not Europe. Confirmation has also been received that the strain of the virus is the “Florida Clade 1” strain, which is endemic to North and South America, and is different from Clade 2 strain that is endemic to Europe. 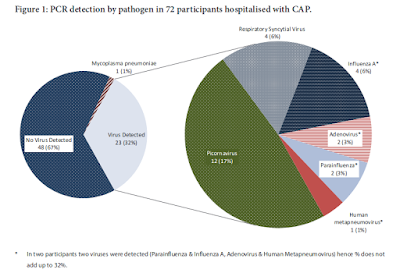 British horses are vaccinated against both Clade 1 and Clade 2, but this is clearly more virulent than the European strain and therefore able to affect vaccinated horses, though the vaccine will provide some protection. The Animal Health Trust provides more detailed information: https://www.aht.org.uk/disease-surveillance/equiflunet/equine-influenza-vaccines.